Writers must have steel egos and not all of us are destined to pen best selling novels and win Pulitzer Prizes. I found out as much when I began submitting my short stories to various publications. This is the way it goes: you stuff a story that you've worked days on into an envelope, along with another one, self addressed and stamped, and then you wait - sometimes weeks, sometimes months, and sometimes longer. There is no greater excitement than seeing one of your return envelopes in the mail box and you hold your breath while opening it. Most of the time you see only your returned short story and a form rejection slip. This happens more often than not. Occasionally, there are a few scribbled words on the slip, sometimes encouraging, sometimes almost devastating. Still, I gleaned enough encouragement from the short words of rejection to keep writing and to keep submitting. Here is a collection of my own rejections, and thanks so much to all you compassionate editors out there. Without you, even the strongest might stop creating and give up their dream. In the oil patch, even the best oil finder drills dry holes and we say, "Just keep drilling." 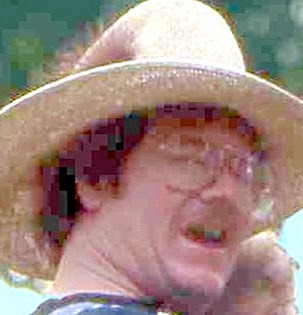 (1) "I could visualize Mamou as a terrific situation comedy or a quick-moving screenplay." (1) "Gary, I enjoyed reading Big Thicket." (2) "I enjoyed the descriptions and imagery and would consider a re-write, longer. I felt it could continue and wanted it to. (1) "I would have been interested without the flowery prose." (2) "The wake is an aside - although interesting. Good Cajun background. Consider revising and resubmitting." (1) "You almost got me with this one because I love the New Orlean's setting." (2) "Try expanding the story a bit." (1) "Nice language. Sorry about the long wait, but the staff was deciding if we could use it or not." (1) "Fun to read, but not our slant." (2) "Some nice stuff — free and loose. Not for us but someone will take it." (3) "Your writing style is close to what we're looking for." (4) "Some beautiful moments here." (2) "The beginning is interesting and I like the characters." (1) "A facinating romp through primitive territory." (2) "I found the story interesting and well written, but not quite right for The Pagan Review." (3) "The writing is strong." (1) "Both the plot summary and writing style convince me that you should try a larger publishing house, and one with a more commercial fiction list." (1) "You're doing some things well here — description, dialogue and insight into characters." (2) Very good details. You made me feel I was there. (1) "Easy to read, had a good hook, kept me interested and I loved the characters — all of them." (2) "Your ms received favorable comments. Looking forward to seeing more of your work." (3) "Displays above average plotting and excellent closure of loose ends and wrap up. Very nicely done!" (4) "Some nice atmosphere here." (5) "I enjoyed reading it and will include it in the Winter 96 issue with your approval." (2) "This story has many nice qualities." (1) "There's powerful stuff in Long Story Short." (2) "I liked the tone of the piece — the wonderful description of two armies avoiding each other." (3) "A powerful, engaging story." (4) "This is a moving, important document; I only regret that we can't use it, having published many pieces of Vietnam, including Richard Curry's "Fatal Light." (1) "You write very well and clearly." (2) "Well written and a good idea." (1) "It's very well written." (2) "Well-described scene. Nicely written, for sure." (4) "Images come together to create a delicate setting for this story. I could almost feel the soft grass Julie buries her head in." (5) "Please keep Boulevard in mind for future submissions." (1) "I liked the story a lot." (2) "You're dealing with some big ideas here." (3) "Impressed with your work; it is definitely of interest to us. Holding for consideration." (4) "Possibly offensive to some, namely close physical descriptions. Has good idea, though." (5) "Interesting little metaphysical twist at the end." (6) "Too mainstream for Happy." (7) "I personally enjoyed your story "Morning Moon at Dawn" very much. (1) "Sorry to say no. Thanks for sending work. Please try us again. (2) "Thanks for sending "Motorcycle" our way. I regret having to disappoint you on this one." (1) "Our mailbox is open to you." (2) Well written. Not something I can use but let me see something else when you can." (3) "Another nice effort with some nice offbeat, hardboiled moves." (1) "Please send us more of your short short fiction." (1) "Made 1st cut. I came close to taking." (1) "You should do well with this one, Eric. Sorry we cannot us it at this time. Thanks for thinking of us." (1) "We did like a lot about this —"
(1) "You have the ability to bring characters to life — to make them seem real and human." (1) "This is what fiction is all about." (1) "I came close to accepting "Dreams" and dislike only what the story says about humankind in general." (2) "You're ms came in 3rd choice. That's still pretty good. Keep going." (3) "Dreams needs lots of work to become creditable fiction." (4) "Yea - this one's in our realm." (1) "Holding for possible inclusion." (1) "I like it very much." (3) "You might try us again." (1) "Too long for us, but liked your writing style." (3) "I enjoy Southern/Western flavored mysteries and handed this up the ladder to Ed (McFadden), but he wasn't quite as grabbed. Sorry, best of luck." (1) "A very readable little piece." (2) "Please keep us in mind with your other stories." (3) "Sorry we couldn't use Henry. It's really quite a good piece, convincing and well written." (5) "Henry has a certain charm about it." (6) "Somewhat overwritten with too many adjectives and metaphors — needs more tension and drama, can be condensed." (2) "Well written, but not twisted enough for us." (3) "The story has potential." (1) "Very good at description, both physical and general." (2) "Interesting take with the old Russ Meyer's name." (1) "The writing is very good, the setting interesting. Try us again sometime." (2) "A nicely done tale but we've recently purchased a similar ‘voodoo' story." Here is a recipe I found in the wonderful cookbook Hot off the Press – Good Cooking from the Pages of the State-Times Morning Advocate published in 1977 by Capital City Press. This recipe was submitted by Lillian Gremillion of Frisco. Soften yeast cake in 1/3 cup lukewarm water to form a paste. Warm the milk and add sugar, oil and yeast mixture. Gradually stir in 2 cups flour and the salt. Stir until it forms a batter. Stir in egg until it is mixed well, and then add rest of flour. Mix well. Cover and set in warm place about 1 ½ hours to rise. Take dough out and roll until about ¼ inch thick. Cut in 2 inch pieces. Place on cookie sheet or pan and let rise another half hour. Fry dough until it is brown and then remove and let drain. Sprinkle with powdered sugar and enjoy. 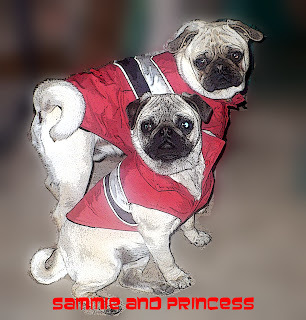 Here is a pic of two of Ron and Shannon’s (RE: Shannon’s Wedding Video) pugs, Sammie and Princess.